Worship is not about entertainment! Worship draws us together as a community into God’s presence and his mission. It is fully about God and it fully involves us. When we gather across differences to celebrate our distinctives, God is honored. Creating atmospheres in worship where people can experience reconciliation, healing and deliverance and move towards a life of just worship inspires me to wake up in the morning. InterVarsity student life introduced me to a theology of reconciliation and ethnic identity. It was on staff in this community that I also grew in integrating worship, culture, and mission. This family continues to be where I deepen relationships with other worship leaders and dig into the messy work of re-imagining worship. 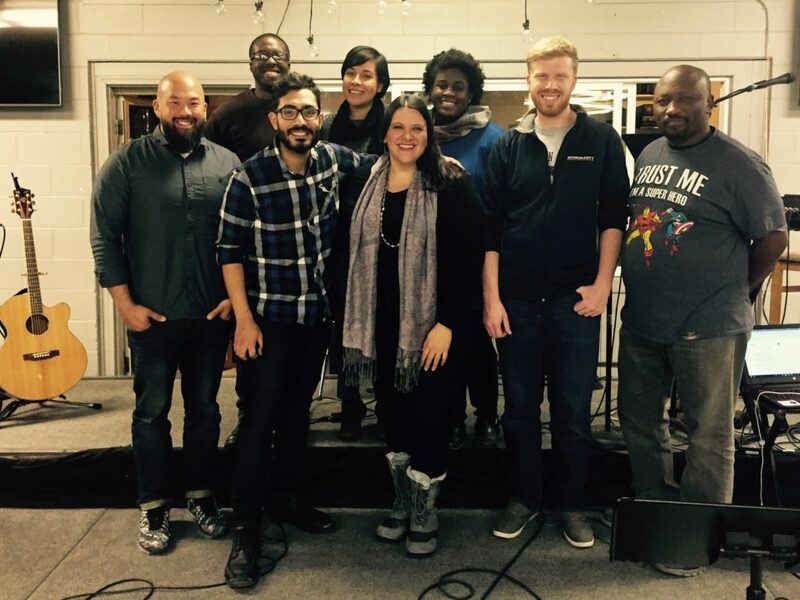 We as a the Staff Conference worship team are committed to re-imagining and creating new models of multiethnic worship. Songs have been selected for our conference that embody the diversity of the InterVarsity community. This is not representational—not every single ethnic group will hear a song from their community. This is not tokenism—I as a Latina will not be the only one who sings the Spanish songs. This is contextual—it will reflect the gifts of the particular worship team and those who have influenced us. Wanna check out what we’ll be singing? Please pray for our team as we collectively prepare to extend hospitality, stand in solidarity, and practice mutuality in worship. Sandra Maria Van Opstal (Worship Director) is the executive pastor of Grace and Peace Community on the west-wide of Chicago. She is the author of the Next Worship (IVP). Michal Chabo (Vocal/Acoustic) is from Syria. Moving to the United States about three years ago, he is now working at Eastbrook Church in Milwaukee as a Worship Leader. Danny Chen (Vocal/Acoustic), is on staff at the University of Central Florida. Danny and his wife Brooke live in Orlando and are excited to welcome the staff family to their city. Todd Epps (Vocals/Keys) has served on InterVarsity staff for five years at Southern Illinois University-Carbondale, focusing on international student ministry. Galvin L. Mathis (Drums), is from South L.A. and currently resides in Oakland, CA where he is planting IV at Laney College. He is a Cal Alum and began his work with IV in 2014. Darin Nicholson (Bass), is founder and CEO of “Max Mode Music”. He is firmly on the road to success, his creative ability as his fuel, and his instruments as his wheels. Melissa Olachea (Vocals), is an IFES/COMPA staff. She serves students in Tijuana as a campus staff and the national movement as a worship leader. Jasmin Rouse (Vocals) is in her sixth year of serving the Metro Pittsburgh Area’s Black campus community. Worship has always been her first love. Melissa Vallejo (Percussion) has led at Urbana, IFES World Assembly in Mexico, and Lausanne Younger Leaders. She is President/CEO of the Reach Someone Foundation. LaDerrick “LA” Williams (Lead Guitar) has served as a lead guitarist for 25 years. He comes from a family of gospel singers & musicians. Steven Ambo (Assistant) is in his fifth year on staff with InterVarsity and is now working with Willamette University’s undergraduate chapter in Salem, Oregon. Joy Pettigrew (Assistant) is a second-year staff at Northwestern University. She grew up in Hong Kong and moved to Chicagoland to attend Wheaton College.